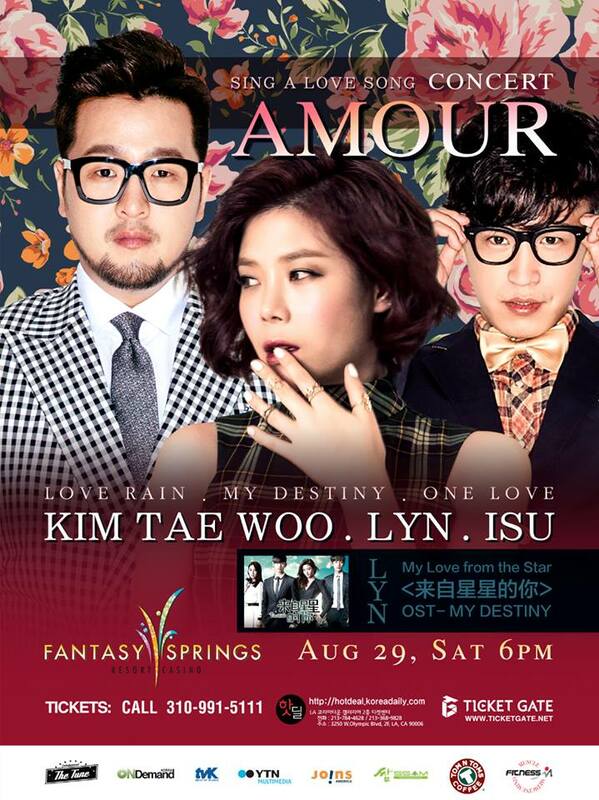 Fantasy Springs Resort and Casino in Indio, CA will host the Amour Concert featuring vocal powerhouses Kim Tae Woo (g.o.d), Isu (MC the Max) and Lyn! For info and ticket information, visit HotDeal! The hit Korean reality show, “Show Me the Money 4” is heading to both LA and NYC on September 10th and September 12th! 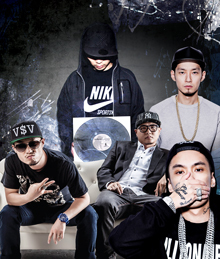 You can catch Verbal Jint, Tablo, San E, Jinusean (LA only), Jay Park, PaloAlto, Loco and more! Visit Powerhouse Live’s Website for more details! 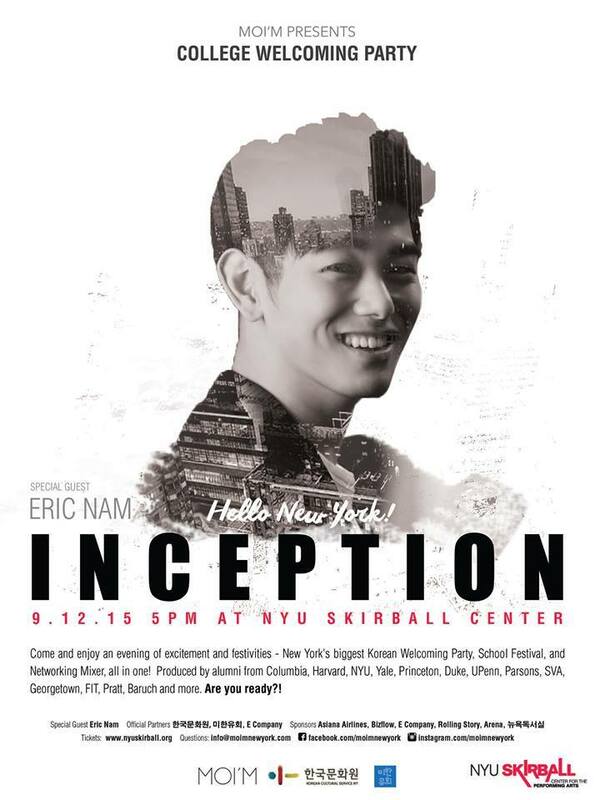 Eric Nam will be making a special appearance at Moi’M’s “Inception” event, which will be held at the NYU Skirball Center on Sept. 12th! He will hold a mini-performance as well as a Q&A with the audience! Attendees will also be able to enter a raffle to win a round trip ticket to Korea! For more info, visit the Event’s homepage! Bada (former SES member) is going to be performing a couple benefit shows in SoCal to raise money for scholarships to help those with physical and developmental disabilities! Find out more info here! But be warned, it’s entirely in Korean! Lol! Mad Decent Block Party has been touring the country for the past month already! 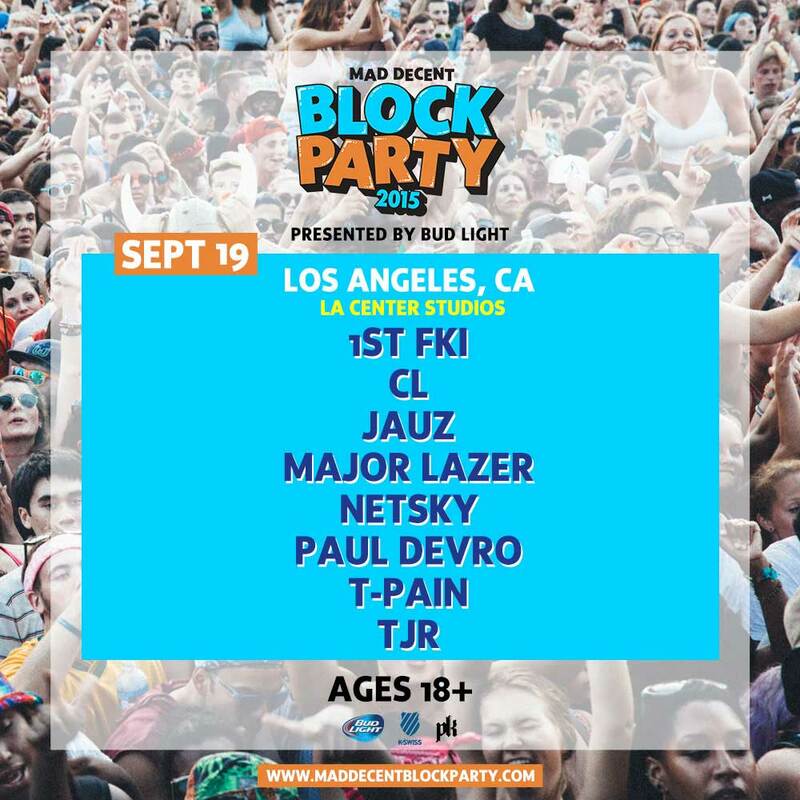 Be sure to catch them on the last leg of the tour, featuring CL Major Lazer, T-Pain and more at LA Center Studios! Check out ticket info here, and visit their main page for more info on the event! BTS is coming back stateside and is set to headline this event! So far, four stops have been confirmed! Check out updated info on TGM Event’s Facebook page! This year’s LA Korean Festival is set to be one of the most exciting yet! Along with the great food and shopping, there will be amazing guest performers this year! Confirmed guests include Kpop group Mamamoo, Singer/Songwriter Esna, Korean rapper Vasco, Cool K and Kim Do Hyun’s DJ group, Geragida, and K-Variety personality, Sam Hammington! For more info, be sure to visit the Festival’s Official Website! 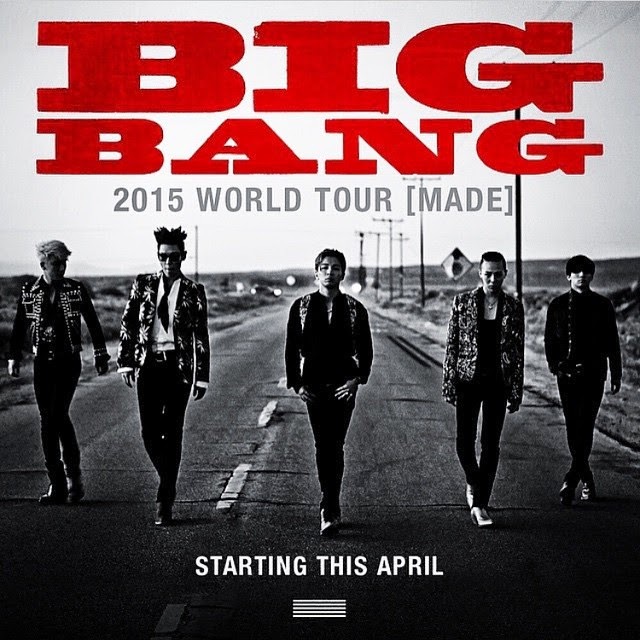 Big Bang is heading to Las Vegas, Anaheim, LA and Newark, NJ this October! Be sure to catch them as they head over for an unprecedented amount of performances here in the U.S! Check out YG’s Official Website for more info! Jessi, the very talented first runner-up from Unpretty Rapstar, is heading to Los Angeles’ Belasco Theatre for a show thanks to KONUS brand! Mighty Mouth will also be there to perform so be sure to check out this event! Tickets should be available soon! Stay updated by visiting Ticketgate’s website! 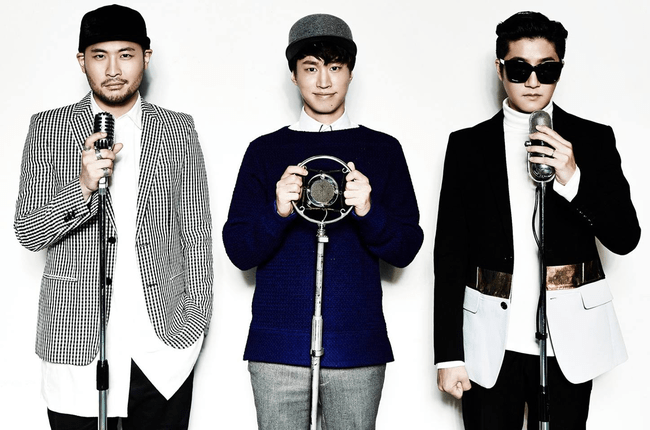 Epik High is coming back to the States for a special show in Honolulu, Hawaii! Check out their main page for location info and ticket info! Meet and Greet tickets go on sale on September 16th at 12:00pm Hawaii time! 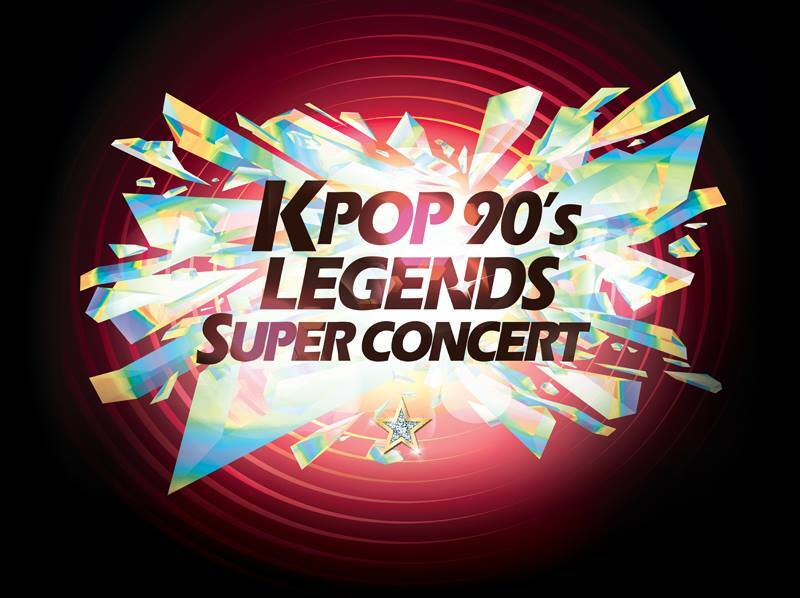 Get ready to travel back to the “golden age” of Kpop, with acts like Jinusean, Jo Sung Mo, DJ Doc and Cool! Check out the promoter’s Facebook page for more info! 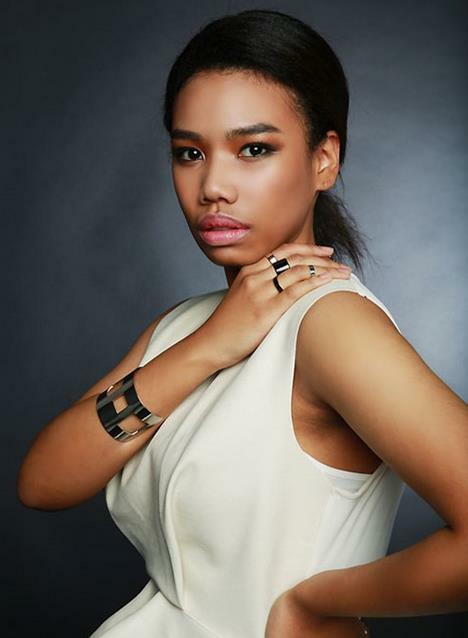 Kpop artist Lee Michelle will be making an appearance in Dallas, TX as part of KCRUSH America Magazine’s special event, which will usher in the 2016 Hallyu Festival & Conference! Ticket holders will be able to add on a lot of perks, including photo opportunities, CD’s and a hi-touch! The event will be hosted by Michael Smith Grant (aka Mr.PopoTv). Stay updated by liking KCRUSH America’s FB page! Tickets are available now on Flavorus! B1A4 is headed back to the States, this time for a single stop in Dallas, TX! Tickets go on sale on September 13th on AXS.com! Check Jazzy Group’s official FB page for updates and more info! 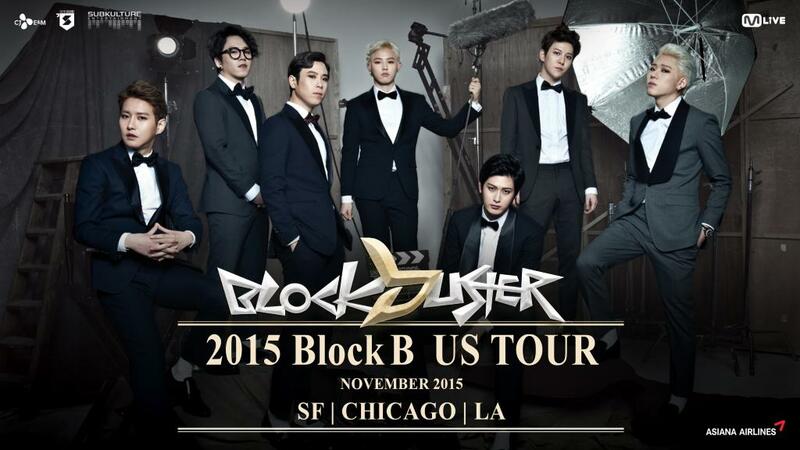 Block B is heading back to the United States for their special, “BlockBuster” tour! They are hitting San Francisco, Chicago, and Los Angeles! Tickets are on-sale now! The diva, Ailee, is going to head to Agua Caliente Casino, Resort and Spa to serenade lucky concertgoers in California on Nov.14th! Check out KoreanConcerts.net for tickets and more info! USC is presenting a night with Korean Hip Hop, conversation and music, brought to you by USC Korean Studies Institute and USC Visions and Voices. It’s a free event, BUT it looks like the initial registration is at capacity. Non-students can still sign up but it will be for the waitlist only, no guarantees. Check their website for more info! 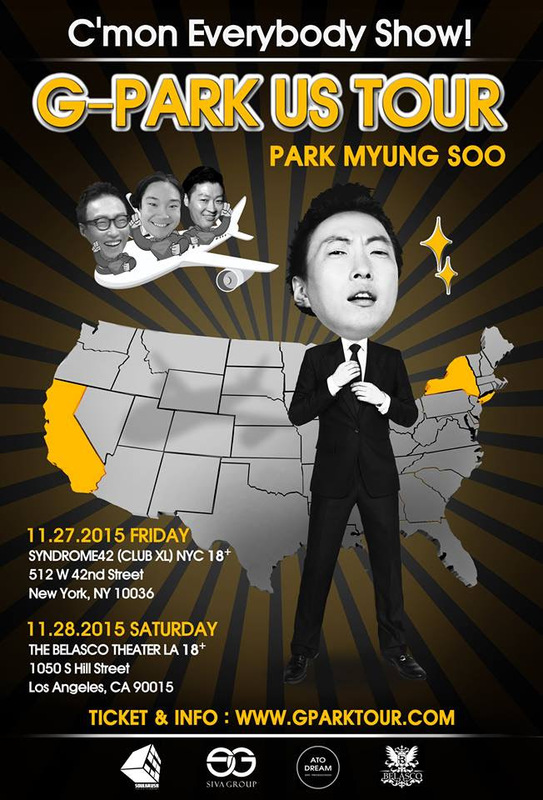 Funny man, Park Myung Soo (Infinity Challenge, Happy Together) is heading to both NYC and LA to hold special sets as G-Park, the EDM master! Purchase tickets on the official site! 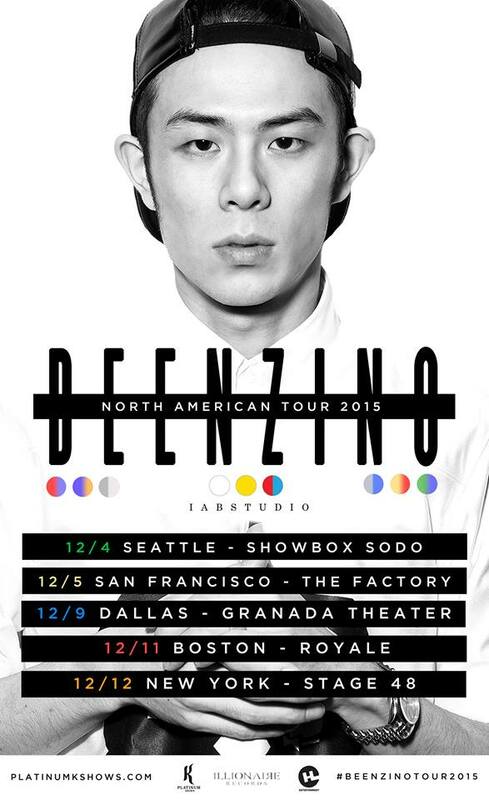 Beenzino is coming back to tour throughout the U.S. for his North American tour! Get ready to support the Illionaire crew! He’ll be stopping in Seattle, San Francisco, Dallas, Boston and New York! Tickets are being released as we speak! You can already purchase your tix for the San Fran stop here! Check out PlatinumK Shows website for more info! Adorable and whimsical girl group, Apink are going to promote their second studio album, Pink Memory stateside! The Pink Memory North American stops are as follows! Tickets are set to go on sale this Friday, Nov. 28th! Check the tour homepage for more info! 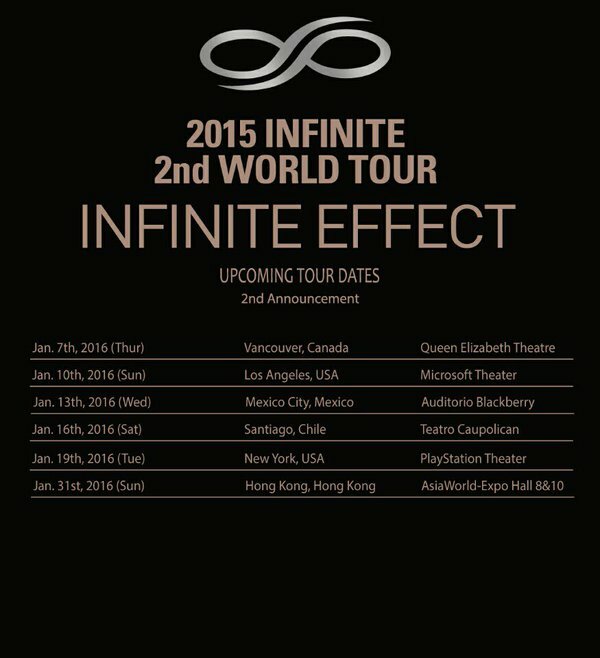 Infinite is heading out on a second world tour and boy is it a doozie! They are stopping in multiple cities across the Americas (including S. America!) for their faithful Inspirits! Follow Infinite’s Twitter for more updates!